Teen Amateur Of The Week: The Sultan Of Swollen! Sam lives with a permanent chip on his shoulder. He was taught to embrace challenges and outwork those who threatened his goals! I was one of the smallest kids at school growing up and experienced much tough love from my older cousins and sibling because I was the smallest member of the family, but it made me tougher. My parents emphasized hard work and never let my size become an excuse. At football practice in sixth grade, the coaches matched me against the biggest guy in hitting drills to make me work harder. That mentality resonated in my head and sticks with me now. Around eighth grade, I hit puberty and a growth spurt. I went from 5-foot-2 to 5-foot-8 in one year. My dad bought my brother lifting equipment for our basement and I started to lift too. I reported to football practice at 5-foot-8 and 125 pounds my freshman year. My brother was a senior team captain and made all-state. I looked up to him and he helped me in the weight room. As a sophomore, I reported to practice at 5-foot-9 and 145 pounds. I got into a fight with a teammate one day and remember him saying, "You will never be anything close to what your brother was." That statement propelled my high school career and put me on the path to where I am today. I worked harder than ever and stayed after three-hour practices to lift. I discovered Bodybuilding.com and learned how to lift correctly. As a junior and senior, I was 5-foot-10, 195 pounds, and became team captain, all-state, and won state as a senior. Something as little as a negative statement can help you find the love of your life. Mine is bodybuilding. I remember seeing my first Ronnie Coleman video and was amazed. I became infatuated with muscle and aesthetics. I sat in class, drew my vision of the perfect body, and dreamt about my workout after school. I read nutrition articles on Bodybuilding.com, which ultimately made the difference. I started to eat right for my body and the gains came fast. I love to better myself every day and want to be the best person I can possibly be in every way. My workout style is pretty old school. I like to approach the gym with a gritty mentality. I don't want to get as big as the pros, but I want to train as hard as them. I keep it simple and use big compound movements every day followed by isolation exercises. I keep my supplementation pretty simple. As a college student who pays rent and bills, I don't have money for too many supplements. Hopefully, I will be sponsored by a supplement company one day. I love the discipline required and I'm addicted to becoming better. I never want to be content. I feel that comfort is a sin. If you become comfortable you stop getting better. If I'm not bettering myself I don't see the point in living. I want to accomplish so much, and bodybuilding helps me do that. I want to be the best I can possibly be. Arnold. His desire to win is contagious. I will always remember him saying that if you do something you better do your best. I will never say I only want to be a good bodybuilder. No. I want to be the best. Period. In life, it is my parents. They drilled into my head that we may not be the biggest, strongest, or smartest, but we have the most heart and we are willing to outwork the other guy. That's the attitude I have today. You must have a chip on your shoulder at all times. Before I go to the gym, I look up motivational videos on Bodybuilding.com or YouTube, but my true motivation comes from within. I need to be the best. There have been a few times when a girl broke up with me or a guy made me mad. That gave me intense focus in the gym for a week or two. I want to compete in men's physique and become the best. Whether that's realistic or not doesn't matter. I want to get into fitness modeling and be on magazine covers. Finally, I want to motivate others to change their lives. This sport is great and I want to give back and help others achieve their dreams. Approach every day with passion and truly love what you do. Love every muscle-aching rep, every egg white you force down, and every step you take when you're sore as hell after leg day. Love it because you know it makes you better. Love it because you know you're doing it for a purpose. You have goals. Do everything in your power to achieve them and enjoy it along the way. I really look up to Arnold, Steve Cook, Rob Riches, and Greg Plitt. I love how hard they work and their intensity. They have motivated and educated me in different ways. 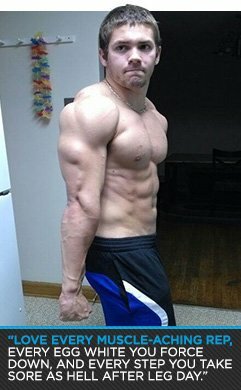 Bodybuilding.com has been a huge help. If it weren't for Bodybuilding.com's nutrition forum, I would probably still be putting ice cream in my protein shake. I also buy my supplements from the site and really enjoy the inspiration from BodySpace.